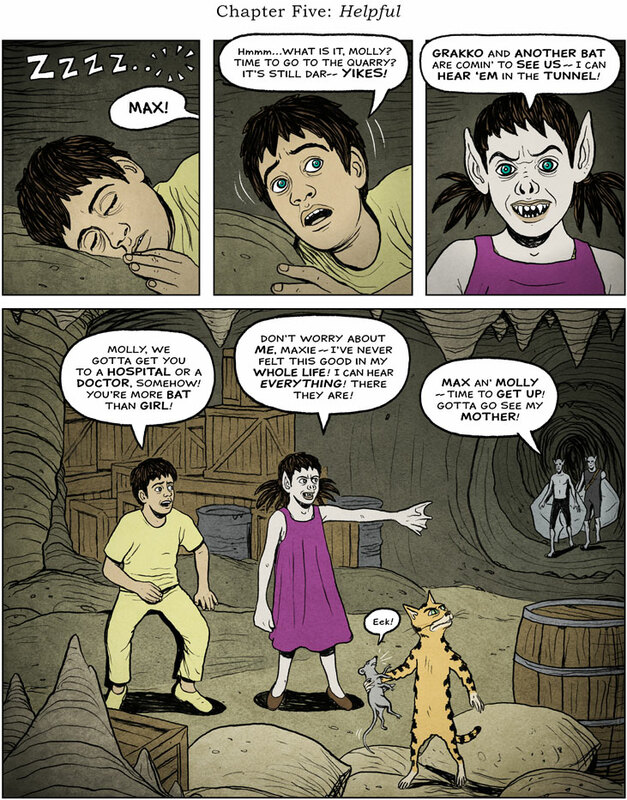 The Moon Prince by Kevin Fraser: Page 301: More Bat Than Girl! Page 301: More Bat Than Girl! Here's the first “new” page of The Moon Prince since May 13th. I put “new” in quotation marks because you may already have read it, but with different art! I posted a series of pages with a “cartoonier” drawing style I wanted to test out, then decided to go back to something closer to the traditional way I've been drawing the story since the beginning way back in 2011 - meaning we have to backtrack a bit. So here's the new style I've settled on, which is a little less “clean” than the original but otherwise pretty similar. New pages will be posting every Friday from now on. Thanks as always for reading, and thanks for your patience! What a difference! Even though the less refined style wasn't bad in itself or any less recognisable, I like this one much better, to be honest. It probably might have to do with the setting of the story (airships, queens, moon bats etc. ), that lends itself to a more detailed style. A bit like those wonderful and insanely detailed illustrations found in 19th century books. Anyway, thanks again for telling this vast story. So much better! I felt the "cartoony" style was taking away from the seriousness of the story. Yay! Its back! And more better than before! The most better being that its back! For some reason since Molly has become more bat Ive noticed her arms seem off. They seem longer (like out of scale) to the rest of her body but the other bat people dont. Was wondering why you draw it like this? Thanks Norder, glynis, and Anon! NeverFinal, that's an excellent question. The bats on the Moon have both arms and wings, but being from Earth Molly has only four limbs for her "Moon Madness" to transform - so her arms have lengthen a bit to turn into wings. By the way, everything native to the Moon has six limbs, including the spiders. The Groos don't, though - which begs the question of where they're originally from! - and neither do the pirates, having come to the Moon in Queen Melissa's great grandfather's time (she tells Molly this on page 196) from Earth. That's a story I've love to tell sometime!